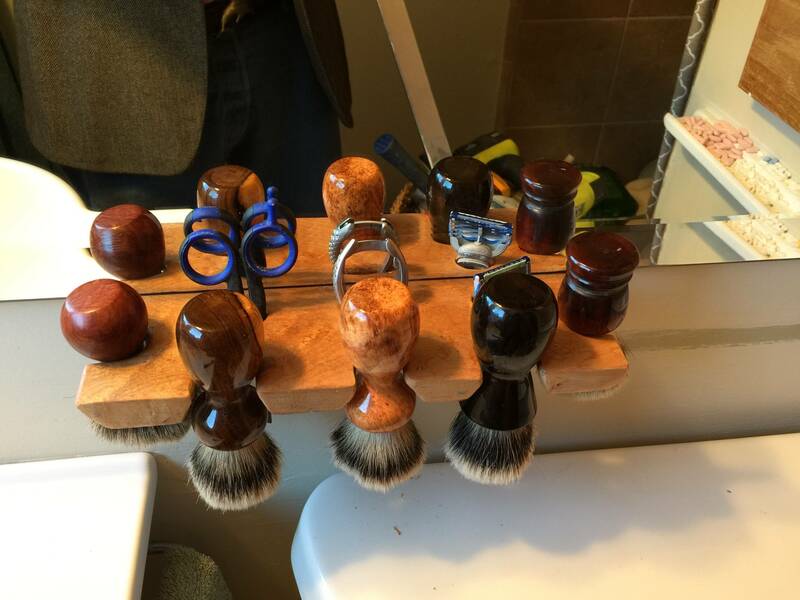 About a foot long, cut from figured maple stock to hold some brushes (an Omega, a Muehle, and a couple of brushes with exotic wood stock), my Gillette, scissors and nail trimmer. It went throughsome design changes, but figured for a small bathroom it would be about right and it is. I've really enjoyed it!! Well done. I see some nice wood handles in there. By the way, welcome to TSN. If you have a chance, go to the Introductions section and tell us about yourself so we can give you a proper welcome. (03-02-2017, 04:06 AM)TheLegalRazor Wrote: Well done. I see some nice wood handles in there. Why, thank you Seems like 'good clean fun' to me. I looked for 'introduction' and didn't see it. Under the heading "The Front Office," you will see a section called "Announcements," followed by a section called "Introductions." Let me know here or by pm if you are having a problem finding it. I like the simplicity, nice! Looks great... you gonna sell them here and/or etsy? (03-03-2017, 08:09 AM)Houdini5150 Wrote: Looks great... you gonna sell them here and/or etsy? Oh, I just bought a couple on Etsy. The craftsman's name is Pat and he is at PC Woodcraft and Pens in nearby San Juan Bautista. He finishes the handles with a very glossy waterproof finish and they look like a million. There is a cherry burl there, a desert ironwood, and then by special order a manzanita burl. His knots are excellent. I think he offers four styles of handles. Thanks for looking.